Capable of 2.5D measurement, the Image Dimension Measurement System IM Series is capable of measuring up to 100 targets at once. 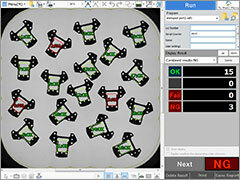 Measurement is also simple with users required only to align the targets and press a button. This drastically improves measurement efficiency. This guide contains information on the latest safety standards and example safety measures for laser markers, which have been attracting a lot of interest in recent years. This is a must-read for anyone who uses laser markers. A Major Collection of Know-How to Help You Get 120% From Vision Systems! · What tricks are there for stabilizing presence/discrimination and individual count inspections? · How do you perform stable detections in printed character inspections even if the state of the printed characters changes? · How do you detect subtle surface color changes? These guides contain such topics and more-the latest know-how for mastering image processing! Want to Improve Efficiency in Magnified Observation, Testing, and Analysis Processes? This guide introduces detailed examples that show how efficiencies were improved in magnified observation, testing, and analysis processes through the introduction of microscopes. Have you ever needed to accurately detect the current positions of a device and target, such as when measuring misalignment, height, and width? KEYENCE's wide-beam laser sensors allow users to perform stable detection.